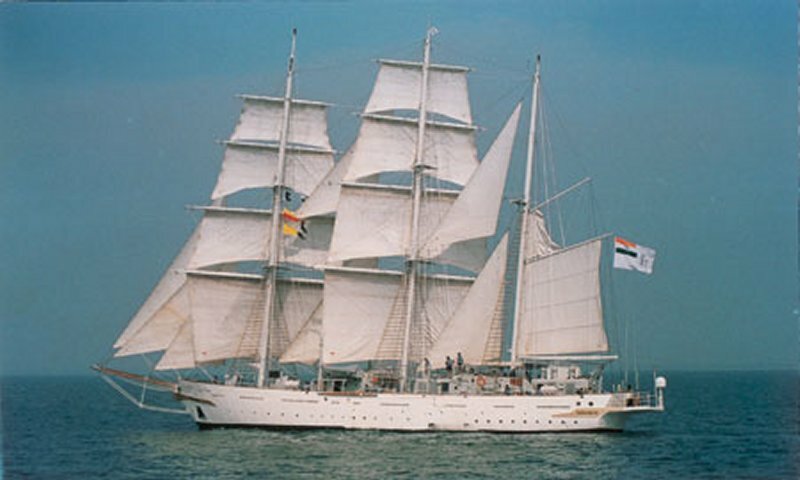 INS Tarangini is the first sail training ship of the Indian Navy. Her name has been derived from the Hindi word tarang which means 'waves'. Constructed by Goa Shipyard Limited (GSL), she was commissioned in the Indian Navy on November 11, 1997. The ship's complement includes 6 officers, 27 crew and 30 trainees. She provides an ideal setting for the first-hand experience to the cadets embarking on a Naval career. 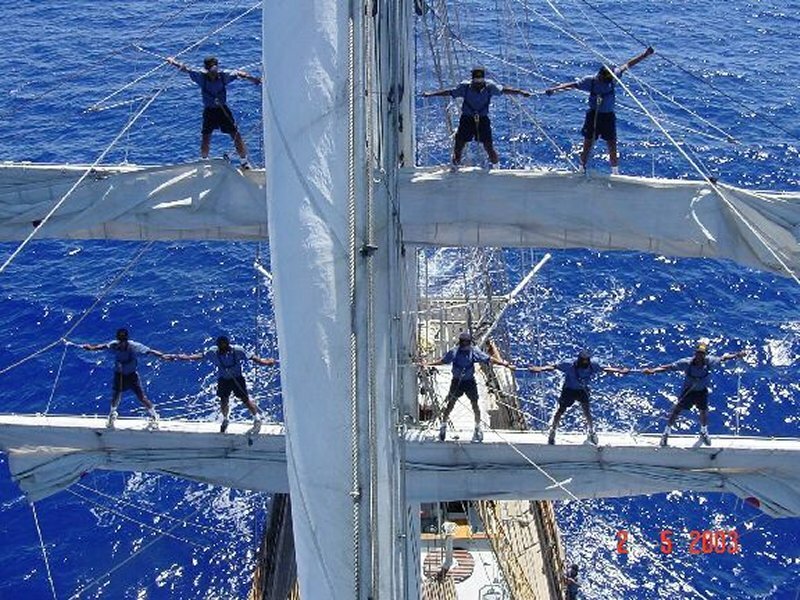 The training onboard aims not only to expose young officers and sailors to the use of sails and various types of operations of the ships of bygone era but also to inclucate in each trainee, esprit de corps, physical and mental agility and leadership qualities. INS Tarangini is not only a sail training ship but also an ambassador of India's rich maritime heritage, traditions, customs and practices. Keeping this in view, the Commissioning Captain of the ship Cdr Motiwala envisaged a plan for circumnavigation of the globe by Tarangini in March 2002. The Naval Headquarters planned the voyage Lokayan with 'bridges of friendship across the oceans' as its theme. Navy also wanted to showcase the nation's superior seafaring capabilities. During this voyage, Tarangini interacts with the regional navies to project India as a major maritime and seafaring nation. Combined training would also be imparted to the cadets of the Indian Navy, trainees of Indian Coast Guard and, most importantly, to the trainees of friendly foreign countries. 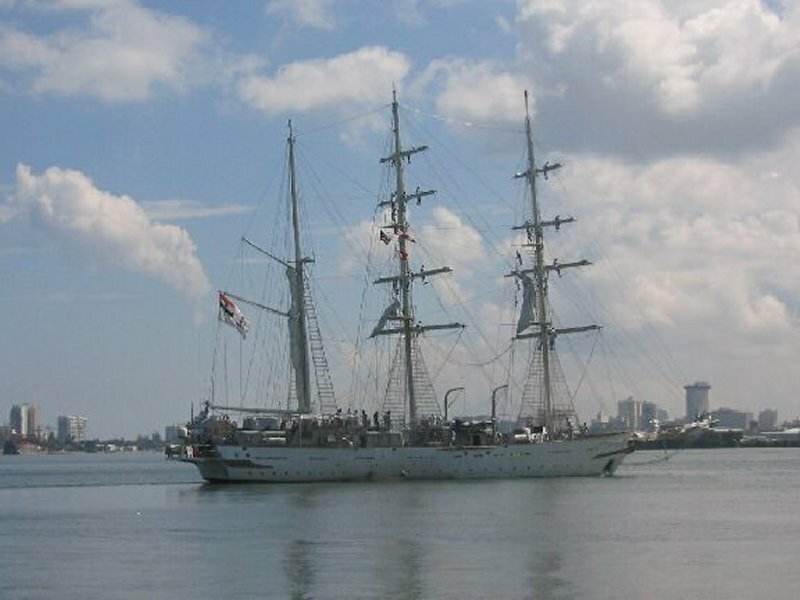 Headquarters, Southern Naval Command commenced the preparation for this Herculean task by selecting volunteers and imparting extensive sail training to them. The ship was put through a refit at GSL and various additions and alterations like fitment of a new gyro, data logging system and AC in mess decks were carried out to augment the overall condition. Circumnavigating the earth means sailing through Atlantic and Pacific, visiting 36 ports during a span of 16 months and covering 32,875 miles while spending 287 days at sea. The expedition was divided into six legs with some maintenance periods in Canada and Australia. The Commanding Officer and the crew were to be turned around during various phases of these legs. 25 July 2002 last year saw Tarangini depart from Kochi for her trial voyage. She visited Mauritius, Seychelles and Maldives, covered 5000 miles and returned harbour on September 18, last year. The crew braved rough seas, strong winds and adverse weather conditions. They returned home after testing their ability to capture the globe under sails. This was their rehearsal for the mega event to follow. The Chief of Naval Staff, Admiral Madhvendra Singh flagged off Tarangini on Jaunary 22, this year. Kochi bid farewell to Tarangini with pomp and show. Three caparisoned elephants, Kalarippayattu artists carrying swords and women carrying traditional lamps added colour to the event. The Kerala snake boats followed her out of the channel. 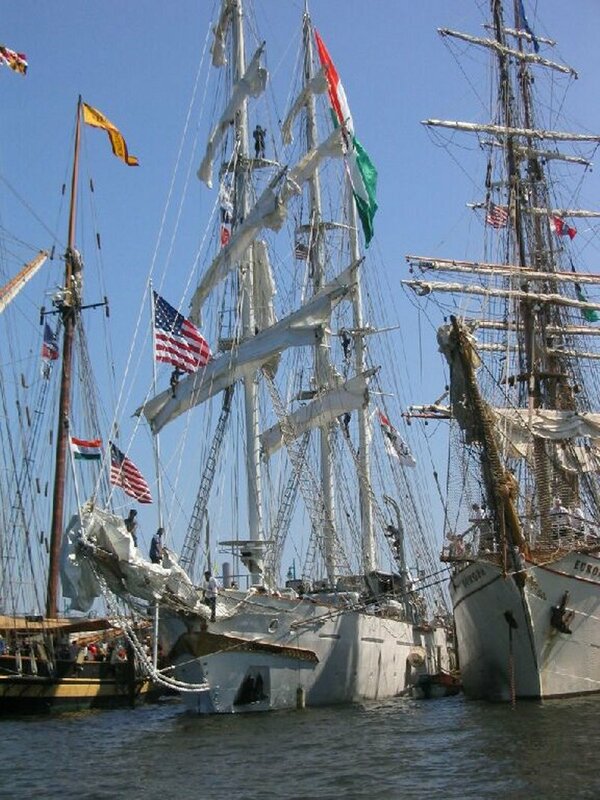 All ships in the harbour were decked up as the cadets manned the masts of Tarangini. On setting course from Kochi, the ship traversed the width of the Arabian Sea and called at the port of Djibouti in early February. Later, the ship transited through the Red Sea to reach Port Said in Egypt. She crossed the Suez and entered the historical city of Alexandria in Egypt. While in transit to her next port of call, Iraklion in Greece, she ran into gale force winds gusting to 60-70 knots. Her sails were ragged but spirit remained pristine. The ship also visited Italy and Greece before reaching Las Palmas in Spain in the Canary Islands. In the second leg, Tarangini crossed Atlantic, cruising 2600 miles in 21 days. Against all prophecies and apprehensions, the sea was tranquil. Blessings of Lord Varuna was with Tarangini. 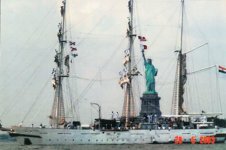 At Bermuda, a quick rest and recreation saw Tarangini set course to New York to participate in Fleet Week celebrations organised by the US Navy. Later, she passed through the great lakes to reach Hamilton in Canada. From Hamilton, Tarangini shaped course for Toronto (Canada) for the Tall Ship race organised by the American Sail Training Association. The race saw participation by as many as 25 vessels. Starting at Toronto this race touched Erie, Cleveland, Toldeo, Chicago, Muskegon and Bay City in USA before ending at Sarnia in Canada by the end of August. From Sarnia, Tarangini headed for Montreal and then to Halifax in Canada. New London was her first port in USA in this leg. The ship also entered Annapolis, the site of US Naval Academy, on her way to Washington DC in October. May Port in Florida was her last port of call in USA. 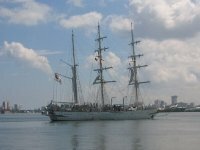 She proceeded to San Juan (Puerto Rico) and reached Balboa in Panama in November. 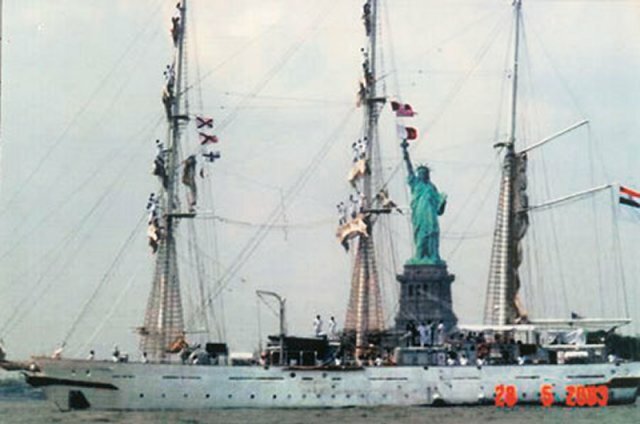 In November 2003, Tarangini sailed from Balboa to Puerto Baquerizo Morento (Equador). At present spreading her sheets to cover 2900 miles in 23 days Tarangini would cross the Pacific to reach Nuku Hiva before christmas. 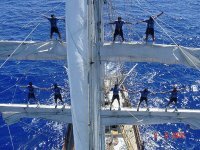 After celebrating New Year at Papeete in French Polynesia she will set sail at Apia (Samoa) and then head for Suva (Fiji). From Suva Tarangini shaped course for Cairns in Australia and arrive there by February 2004. She underwent maintenance for 12 days at this place which would also give the much needed rest to the crew after long voyages. She sailed through Darwin and thereafter head for Jakarta by March. Her voyage from Jakarta took Tarangini through Singapore and Colombo. 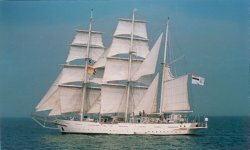 Finally Tarangini returned to Kochi by April 2004 which marked the culmination of the maiden voyage of the Indian sail training ship around the world. Now, all eyes are set on this unique ship which has been making her presence across the globe.